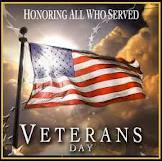 Veterans Day is an annual United States holiday honoring military veterans. A federal holiday, it is observed on November 11. It is also celebrated as Armistice Day or Remembrance Day in other parts of the world, falling on November 11, the anniversary of the signing of the Armistice that ended World War I. Major hostilities of World War I were formally ended at the 11th hour of the 11th day of the 11th month of 1918 with the German signing of the Armistice. Sloane Realty would like to thank veterans across the U.S. for their service to our country. If you’re looking for accommodations for an upcoming North Carolina vacation we have Sunset Beach NC beach house rentals that are sure to meet your needs. Look around at what the area has to offer and we’re sure you’ll return to our fine Sunset Beach NC beach house rentals where we offer amenities that just can’t be beat. We wish everyone a safe Veterans Day.